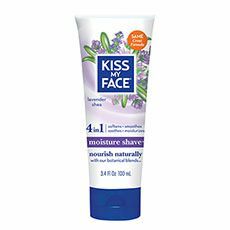 Here’s another great product from our friends at Kiss My Face – their 4-in-1 Moisture Shave. With our active lifestyle, we TrailblazerGirls want to make sure we have silky smooth legs, and this shaving cream will certainly help us! Filled with natural ingredients like vitamin E, golden seal, lemongrass, aloe, and olive and coconut oils, they work in combination to soften, smooth, soothe, and moisturize your skin. A small amount lathers up nicely in the shower and allows you to get a close shave, leaving your skin smooth and moisturized. Available fragrance free and in 6 scents.